From my experience, people have one of two relationships with astrology. There are ones who seek understanding in the cosmetic influence, and then there are the Sheldon Coopers of the world that wholly believe it is arbitrary nonsense. I personally have always found my horoscope highly relatable, if not spot on. (I know, judge if you must.) This doesn’t mean I'll blow my entire savings on lottery tickets if the stars destine me to good fortune, but I will occasionally read my daily horoscope app and screenshot a text over to my BFF with the words “OMG LOOK!! !” whenever I read something that vaguely describes me. I am also a very enthusiastic book-pusher, especially when it comes to Young Adult literature. There is nothing more relatable than the universal feelings of teenagedom. Add in high stakes, fantastical lands, and love interests for the ultimate arise of conflicts and complications, and BAM, you have yourself a marvelously intriguing read. So instead of making off-hand recommendations for you, I decided to put together the perfect pairing of YA novels you should read next based on your astrological sign. Unsure of what to read next? LOOK TO THE STARS. Obviously. Aries, you tend to have a fiery passion for the things you love, as well as a natural-born-leader instinct. Extraction is a thrilling, fast-paced sci-fi, guaranteed to hold your attention until the very end. Taurus, you're an exceptionally loyal friend, and often resistant to change, which is why you might enjoy Emily as a narrator. Matson’s contemporary YA unravels the mystery of what happens when Emily’s BFF disappears, leaving her a random to-do list to help her to break free of her comfort zone. Because Geminis tend to be witty and lively, you may relate to Audrey in more ways than one. Packed with humorous dialogue, Audrey deals with the aftermath when the breakup song her ex-boyfriend wrote goes viral. Known to have highly emotional souls and a strong bond to family, since you're a Cancer, you might love Nelson’s beautifully written novel. Told in the twin’s dual points of view, the pages uncover what happened to break the bond of these two characters and if their relationship will ever be the same. As strong, driven, and determined, you will enjoy the action-packed world Maas creates in Throne of Glass. As a Leo, you may enjoy the confidence of Celaena Sardothien, the main character, and her corrupted journey to freedom. As a Virgo, your sincere yet perfectionistic attitude may parallel Macy in The Truth About Forever, who believes she must strive to be the perfect daughter and student. But things begin to shift after she meets a new group of friends — and a certain boy — during her new summer job. Since Libras are balanced, diplomatic, and kind people, you may be intrigued by this haunting, suspenseful story. Filled with damaged families and a tight group of friends, We Were Liars will keep you on your toes until the very end. A dedicated and ambitious Scorpio, you might enjoy Juliet’s journey throughout this read. Inspired by H. G. Wells's The Island of Dr. Moreau , Juliet’s determination leads her to discovering the truth about her father’s experimentations — and the consequences that have come from them. Since you're likely to be a restless adventurers and a lover of travel, you may love reading about Avery’s high-stakes journey. This DaVinci Code-type thriller is a fast-paced mystery sure to keep you hooked. 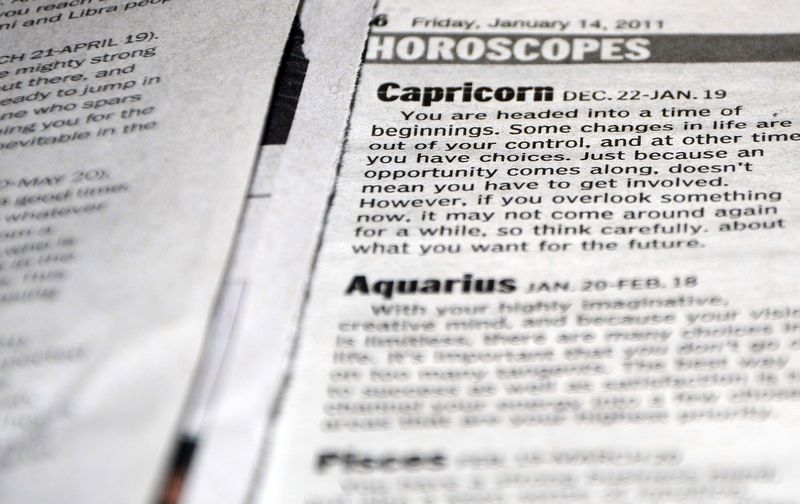 Ambitious and pragmatic, as a Capricorns, you might enjoy this honest contemporary. The evocative writing style and Amber’s driven mindset to achieve her dream of nailing her audition for arts school will keep you intrigued. As a highly, independent people and rebellious adventurer, you may love following Nic’s story throughout this enriching world. Complete with magic, conspiracy, and action, there’s no way you could ever be bored. As a creative dreamer, moody Pisces, you might enjoy this dreamy, captivating magical realism novel. This is an intriguing story surrounds a young woman’s kidnapping and what happens when no one believes the only witness.